Can't percisely imagine the real need for this AirPlay feature for streaming FIFA world Cup 2018 on Apple TV, but if you are running a pub equipped with Apple TV set and hope to replay those facinating games on big screen during days without live matches, in an endless loop, 5KPlayer can help a lot! 5KPlayer lets you gather World Cup match videos locally and stream 2018 World Cup Matches to Apple TV free via AirPlay. You can save tons of World Cup full matches, highlights, music videos on local storage and AirPlay stream them to your big screen. 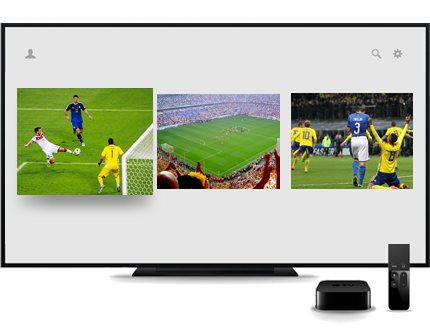 To beam FIFA World Cup videos to Apple TV, you need to prepare those video contents in advance. You can either free download World Cup highlights, opening ceremony, Messi skills videos, Ronaldo's skills videos, FIFA official song Live It Up, and even videos of cheerleading beauties. 5KPlayer allows you to free download those videos from 300+ online video sites including YouTube, metacafe and VEVO. You can get 4K/UHD world cup videos saved easily on your PC/Mac, external hard drives, USB, and even iPhone/iPad devices. Make sure that those videos are in AirPlay compatible formats in *.mp3 , *.aac , *.m4a , *.m4v , *.mp4, and *.mov files, otherwise the content won't be successfully stream via Bonjour protocol. How to AirPlay Stream FIFA World Cup 2018 to Apple TV? Step 1: Launch 5KPlayer and click on "AirPlay" button and select the target receiver "Apple TV". Step 2: Open a World Cup video clip with this AirPlay streaming player - 5KPlayer. Note: Make sure your Apple TV and your computer are connected with same network/WIFI, otherwise 5KPlayer won't be able to detect Apple TV as the target AirPlay receiver. Apart from watching FIFA World Cup streams on Apple TV, other sports games you might also find interesting to download and watch: Olympic Games opening ceremony, NBA playoffs finals, Tour De France Race 2017, and World Baseball Classic. Get 5KPlayer now to stream them all instantly!